Christmas is around the corner and so are the family get togethers. We understand that some of you must have been too busy to have gone out shopping for gifts and right now, time is precious as hardly few days are left! 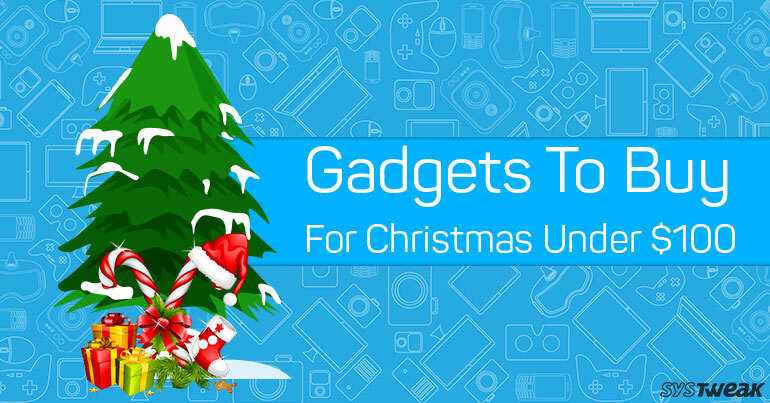 To save you time and resources we have handpicked the best gadgets under $100 to gift this Christmas. And well! If you fancy anything, you can gift yourself one of these too. Amazon Echo is talk of the town. Moreover, there is nothing more attractive than All-New Echo (2nd Generation). This is the gift that can be used and loved by all age groups. It is a useful gadget that quickly lets you connect to Alexa to play music, control smart home devices, set up calls, alarms, timers, to check your calendar, weather, traffic, sports scores, and much more on tips of your finger. In fact, you can request an Uber and order a pizza with it, isn’t it cool? It is a smart choice for any tech-savvy friend or family member. Skullcandy’s Hesh 2 wireless headphone can’t go wrong when you’re looking for a suitable gift. It comes with up to 15 hours long battery life of music to give next level listening experience. Best of all, it comes with soft synthetic leather ear cushions that provide all-day comfort to the ears. It is suitable for day to day life while commuting with your longest playlist. To top it all, it is available for just $ 49.99, indeed it is a perfect Christmas gift. It is an amazing gift that almost everyone wants to use in their day to day life. You can listen to music with a portable waterproof Bluetooth speaker in a shower to release your anxiety and stress. As this portable speaker keeps on playing up to 100 feet (30M) away, you can use it to dance on your favorite track at small parties and family gathering. It keeps on playing your playlist up to 10 hours on a single charge so you can surely add it to your shopping bag. Google Daydream View is a virtual reality headset that not only sees the world but lets us experience it. It is another advanced technology which is improving day by day. It is a high-quality device that lets you experience any sport and concerts in full 360-degree panoramic view. It is smart, affordable and best Christmas gift that is quite popular among teenage kids. Nowadays, most of us are concerned about fitness and sleeping hours. So, there can’t anything else to select for Christmas than selecting a fitness and sleep tracker. It is a smart device that can track your footsteps, calories, and sleep hours. Moreover, it vibrates along with alerts for text notifications and calls. As it is a swim proof gadget you don’t need to take if off from your hand for anything. Certainly, it can be considered as a Christmas present that comes under $ 80. A wireless charging pad is not only charging your phone with ease but also enhances the look of your table. This charger is designed in collaboration with Apple, and quickly charges up your for iPhone 8, iPhone 8 Plus and iPhone X phone. As Belkin, wireless charging pad is another gift that comes under $100, you can grab it to surprise your best friend. Instant Pot is a multi-use programmable pressure cooker that is built using advanced technology. It is useful to monitor temperature, adjust heating intensity and duration to get your desired results each time. It is one of the best great choices to gift a gadget that your mother and granny can also use without any trouble. It comes with 14 Smart Programs and allows you to use instant pot for prepare soup, meat, rice, and many more. As, Christmas is the time of getting heavy discounts from big brands, so it is the perfect time to buy presents for friends and family and shower your love on them. So, we hope you find something in the above list to surprise your near and dear ones.